Every parent loves their kids’ and wants to spend enough time with them. But due to professional chores, parents are unable to take good care of their kids. So, child daycare centres come handy as they take good care of your child during the day time.A parent doesn’t sign their kid up blindly in a daycare centre. They will check everything such as license of the daycare centre, services provided, how old it is, number of kids, staff availability, staff to kid ratio etc. 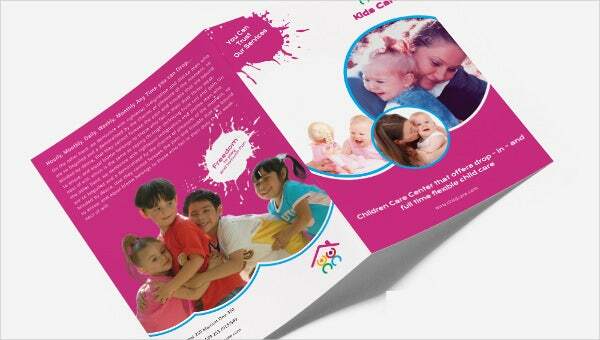 A brochure is a perfect element to tell about your daycare service in an effective manner. This is why we have designed daycare A4 Bifold brochures with a professional touch. In this, a daycare provider can add lovely images of kids’, tell about your service, programs offered, admission structure and add contact information.